IGCAR Notification is out. IGCAR is recruiting for 130 Trade Apprentices Govt Job Posts. You can check IGCAR - Indira Gandhi Centre for Atomic Energy last date, download IGCAR notification, visit IGCAR official website and check other IGCAR Vacancy details.Complete Vacancy and recruitment Details about 130 Trade Apprentices Govt Job vacancies in IGCAR are provided below by JobSarkari.Com only for you. Last Date of Apply Online. 24/04/2019. Fitter. Candidate Must Have Passed Class 10th And Having 2 Years ITI in Related Field. 30. Tuner. Candidate Must Have Passed Class 10th And Having 2 Years ITI in Related Field. 05. Machinist. Candidate Must Have Passed Class 10th And Having 2 Years ITI in Related Field. 05. Electrician. Candidate Must Have Passed Class 10th And Having 2 Years ITI in Related Field. 25. Welder (Gas & Electric). Candidate Must Have Passed Class 10th And Having 1 Year ITI in Related Field. 07. Electronic Mechanic. Candidate Must Have Passed Class 10th And Having 2 Years ITI in Related Field. 10. Instrument Mechanic. Candidate Must Have Passed Class 10th And Having 2 Years ITI in Related Field. 12. Draughtsman (Mechanical). Candidate Must Have Passed Class 10th And Having 2 Years ITI in Related Field. 08. Draughtsman (Civil). Candidate Must Have Passed Class 10th And Having 2 Years ITI in Related Field. 02. Mechanic Refrigeration & Air Conditioning. Candidate Must Have Passed Class 10th And Having 2 Years ITI in Related Field. 08. Carpenter. Candidate Must Have Passed Class 10th And Having 1 Year ITI in Related Field. 04. Mechanical Machine Tool Maintenance. Candidate Must Have Passed Class 10th And Having 2 Years ITI in Related Field. 02. Plumber. Candidate Must Have Passed Class 10th And Having 1 Year ITI in Related Field. 02. Mason/ Civil Mistry. Candidate Must Have Passed Class 08th And Having 1 Year ITI in Related Field. 02. Book Binder. Candidate Must Have Passed Class 08th And Having 1 Year ITI in Related Field. 01. PASAA. Candidate Must Have Passed Class 10th And Having National Trade Certificate. 07. Age Relaxation. 3 Years For OBC, 5 Years For SC/ ST And 10 Years For PH. 3. Candidates are Required to Fill All the Details Carefully Like Name, Mobile No And E Mail ID. 4. After Save the Data System Will Generate the Registration Number And Password As Displayed on Screen as Well as Through SMS and E.Mail. 5. Candidate Have to Log In their ID With Registration No And Password. 6. Please Remember and Save your Registration no And Password for Further References. 7. Online Application Can be Submitted on or Before 24th April 2019. Q. 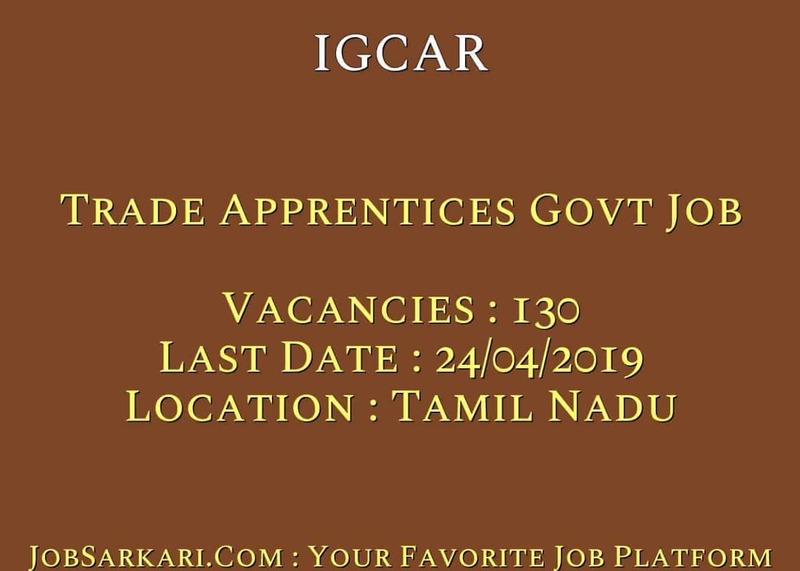 What is the Last Date For IGCAR Trade Apprentices Govt Job Vacancy ? A. 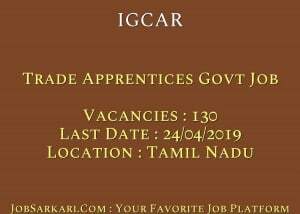 Last Date for IGCAR Trade Apprentices Govt Job Posts is 24/04/2019. Q. What is the Form Type of IGCAR Trade Apprentices Govt Job Recruitment ? A. The Form Type for IGCAR Trade Apprentices Govt Job Posts is Online. Q. How many vacancies are available in Indira Gandhi Centre for Atomic Energy Trade Apprentices Govt Job Posts ? A. There are about 100 Vacancies in Indira Gandhi Centre for Atomic Energy Trade Apprentices Govt Job Posts. Q. What is the Full Form of IGCAR ? A. Full Form of IGCAR is Indira Gandhi Centre for Atomic Energy .